On the western shore of Lake Como, across from Bellagio and just north of Lenno and its Villa Balbianello, is the town of Tremezzo and what is, for my money, the best villa to visit on Lake Como, the Villa Carlotta ★★. This is not only one of the most sumptuous palatial homes on the lake—a late baroque villa filled with Neoclassical statues and Romantic paintings—but for once the building itself is open to the public. The main building is now am elegant showcase for the villa's private art collection—small, but quite good. It includes a Palamede by Antonio Canova, the greatest sculptor of the Neoclassical era, as well as a a Cupid and Psyche by his student Tadolini. 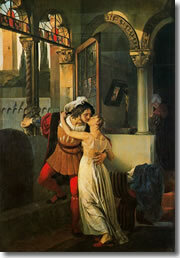 What really moves the postcards off the racks, though, is a famed Last Kiss of Romeo and Juliet by Francesco Hayez (1823), the master of stolen-kiss scenes. The villa is surrounded by exquisitely landscaped gardens, a lush botanical cornucopia covering nearly 20 acres with over 500 species. 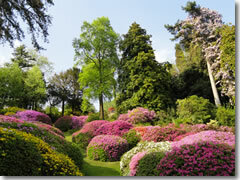 You'll find everything here from camellias, azaleas, rhododendrons (over 150 varieties), laurel and citrus trees to bananas, papyrus, bamboo, and tea. The Carlotta owes its beauty and fame to three owners. The late baroque villa itself was begun in 1690 for the Marquis Giorgio Clerici. In 1801 it passed to a self-made lawyer named Gian Battista Sommariva, who filled it with important Neoclassical sculptures and Romantic paintings. In 1847, the villa went to the Prussian Princess Carlotta, who lent it her name while her husband, Prince Georg II of Saxe-Meiningen, furnished it in Empire style. Sadly, the princess died seven years later, giving birth to their fourth child. Prince Georg II, however, was an interesting bloke (if frankly frightening to look at). Later in life, he would found and direct a theater company back home in Germany and pretty much invent our modern concept of theatrical direction—creating purpose-designed sets, costume, and lighting, but also the concept of rigorously rehearsing the scenes with the actors. 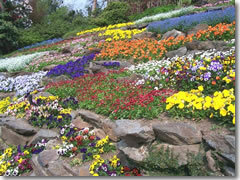 On the side, he had an orchestra and opera company, and he discovered Richard Strauss. Sadly, before all that, when he was still at the Villa Carlotta, he sold most of the amazing art collection that Commariva had left. What remains of the art is still quite stunning. In summer (late June though August), the villa hosts classical music performances (mostly piano; sometimes a string trio) Friday evenings at 9pm. It really is best to use a car and just drive up the S340 from Como town. To arrive by public transportation, follow the instructions on how to get to Como town, then grab the bus (at least hourly; 46–62 min.) or boat (7–10 per day; 37 min.) as detailed below. 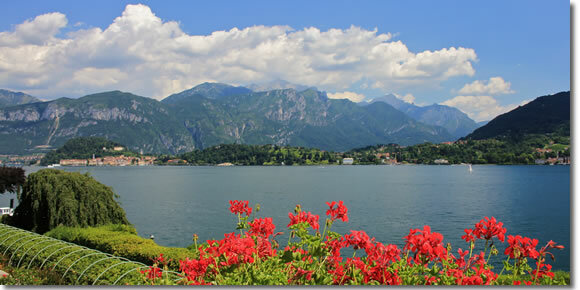 Tremezzo is also a short ferry ride from Bellagio (7–10 daily; 5 min. ).